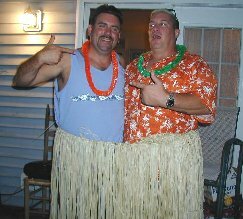 My wife and I really had fun at our end of summer luau this year. We usually try to have a party every summer the same weekend as North Beach's annual Bayfest. Friends can spend the afternoon seeing all the sights down the road, then get together later on for food, spirits, and good conversation. Several years we've had a Surfrider booth at Bayfest, but no one seemed interested in working this year. I couldn't man a booth due to other commitments and my wife was busy cleaning at home so couldn't help set anything up. I actually wish we did have something as I was terribly upset to see four new rock breakwaters installed on each side of the North Beach Pier. The city didn't want any sand washing off their newly expanded beach so they created an environmental abomination to protect it. They also now make visitors buy a permit to walk on the pier. Greed definately has a say in this town. Enough of my philosophy, back to the party. I spent Saturday morning competing in at the ESA Delaware State Championships contest at the IR Inlet and left almost as soon as I took my jersey off after the finals at 2:30 pm. It was a long drive home and I got back just 5 minutes before the party started. My wife was happy with me over that one but I did manage to clean and put decorations up the night before. 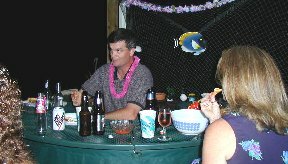 My deck had a nice mix of plants, fish netting, beach shells, hanging tropical fish figures, and even one of those imitation running brooks over rocks. Didn't do much inside the house except start the process of getting rid of some of my old furnature. We have a bar on our deck, and this usually ends up the focal point for our party by the time the sun sets. As is usually the case, our local deer population turned out along our driveway about dark to see all the commotion from their crazy human neighbors. All my kids have gone off to school finally so this was really the first get together in over 25 years that we didn't have any kids around. 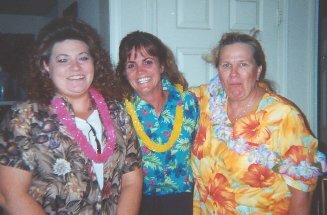 It was also the first luau I have ever attended or had where everyone got lei'd. Whenever anyone new came in they got a lei. Haswell Franklin and wife were wearing the ones they came home from Hawaii with a few weeks ago, but they got new ones anyway. 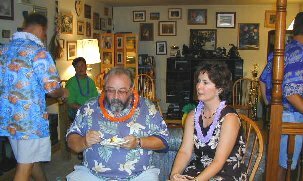 Neal Carver and wife had matching lei's as well. I was surprised when Haswell's Lincoln Town Car pulled down our long driveway and backed into the parking area. It looked like he was riding in the back with a driver in front. Turns out he had his wife drive him down from Baltimore. If I could just get Kim to start driving me around, I would enjoy my trips a little better as well. I had a chance to show off all the pictures and other items in my computer room library (I call it my surf museum) and tell the stories behind them to everyone who attended. I've collected so many neet things in the past 40 years of surfing that they finally all needed a place to rest. My museum offers a nice place to sit, visit, play board games, or whatever when visitors are around. 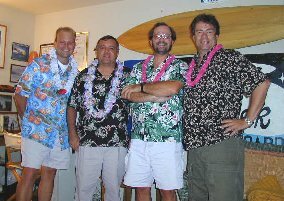 A good mix of folks showed for the luau. Many of the regular Southern Maryland Wrestling Club crew were there plus Annapolis Surf Club locals and a couple of new friends as well. 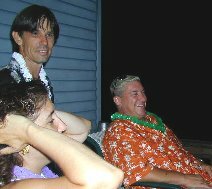 KC Filer and Rod Rodgers (and their wives) were there from the alt.surf (AS) Crew. They arrived a little late. Had gotten lost and passed the entry road to my place several times before calling. My surf regular partner Neil and his wife brought some great Hawaiian snacks but were just beat out in the best snack contest by Mike Rowe. 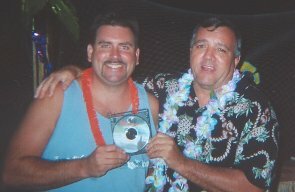 He won the Memories CD with a tropical variation of pigs in a blanket that were absolutely delicious. 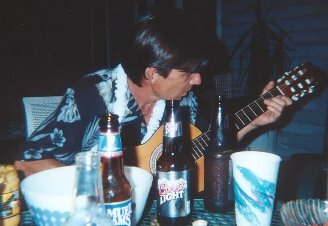 Kevin Buff, who writes songs and plays a mean guitar, composed a song about Mike's wife and a couple of other party regulars who didn't show. We called the song "Who Didn't Come", and managed to get much of it on tape until the battery on the cam recorder quit on us. Mike's wife, of course recieved many of the versus since she sampled the punch she was making for the luau a little too much and then couldn't make it to the party. That's a new one on me. My new RS Skip Savage Con Rail Snake Board was out for everyone to look at. I picked it up from K-Coast while at the contest that morning. It's another snake longboard for me. I can't wait to try it out. I had my four favorite surf music CDs going strong all night. I don't think it kept all the bugs off though but my bug lights did smoke quite a few. I also had the bee spray out and made a direct hit on a wasp that decided to build a home in one of my driftwood pieces, Turned it into a pipe at one end before I got it with the spray in mid-air. After my third spray during the party, I had to put the can down as I managed to spray all over my wife's big tropical plant on the deck which she didn't appreciate. Below are some of the digital pictures. I'll have more when the regular pictures get developed. Rick Jones in the Bar's "Hot Seat"
Kevin Buff - "Mean Guitar Machine"